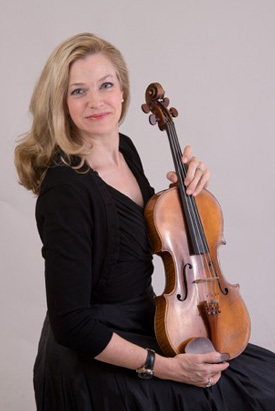 Since September 2005, violist Caroline Coade has been a member of the viola faculty at the University of Michigan School of Music, Theatre, and Dance. In 2016, she was named assistant professor of viola at SMTD. She has given master classes at the Oberlin Conservatory (OH), Boston University (MA), Longy School of Music (MA), Baylor University (TX), and Colburn School (CA). Coade’s students have won coveted spots at The Curtis Institute of Music, The Juilliard School, Rice University, Indiana University, Oberlin Conservatory, Boston University, Eastman School of Music, Cleveland Institute of Music, SMTD, New England Conservatory, and Yale University. In 2018, Coade will be a member of the prestigious Primrose International Viola Competition (PIVC) as a preliminary round judge. In 2014, Coade was one of nine international judges for the final rounds of the Primrose Competition at the Colburn School. Concurrent with her teaching activities at University of Michigan, Coade is a long time member of the Detroit Symphony Orchestra and served as the assistant principal violist during the 2013-16 seasons. She is currently the 3rd chair violist with the DSO. In addition to her position in Detroit, Coade has performed with the Cleveland Orchestra, the Philadelphia Orchestra, and the New York Philharmonic. In 2016, Coade was named the artistic director for WRCJ 90.9FM’s Classical Brunch chamber music series at the Community House in Birmingham, MI. In this role, she is responsible for hiring the musical artists as well as coordinating the event logistics and creating voice overs for WRCJ radio ads. In addition to performing with her Detroit Symphony colleagues and presenting new young artists on the Classical Brunch series,Coade has performed chamber music with violinist Frank Almond on his Frankly Music series (WI), at the Great Lakes Chamber Music Festival (MI), and the Marlboro Music Festival (VT). As the violist with the Woodland Trio (flute, viola, harp), she concertized around the U.S, Canada, and at the Printemps Musicale des Alizes of Morocco. Ms. Coade continues her position as full-time artist/faculty at Center Stage Strings for summer 2018. She was guest artist at Center Stage Strings in Three Rivers, CA for summer 2015 and joined the full-time artist/faculty of Center Stage Strings MPulse Institute at its new home at the University of Michigan for summers 2016 and 2017. Previously, Coade was artist faculty at the Chautauqua Institution Music Festival in New York (summers 2012-15) and at the Bowdoin International Music Festival in Maine (summers 2012-15). Ms. Coade spent three summers as artist faculty at the National Music Festival in Chestertown, MD (summers 2011-13). A San Diego native, Coade began taking Suzuki violin lessons at age 6 and switched to the viola at age 14. She graduated from the Interlochen Arts Academy (MI) and went on to receive a bachelor of music degree from the Oberlin Conservatory, an artist diploma from The Curtis Institute of Music, and a master of music degree from The Juilliard School. Her principal teachers include Karen Tuttle, Joyce Robbins, Jeffrey Irvine, David Takeno, David Holland, and Eugene Becker. Ms. Coade plays on a Domenico Busan viola c. 1750 on generous loan from The Mandell Collection of Southern California.